The start of a race on Sunday for the High Schools fleet. 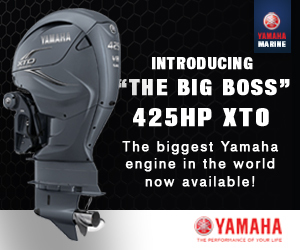 In the center is the Tera Pro sailed by Ryan Hughes of Knysna High. 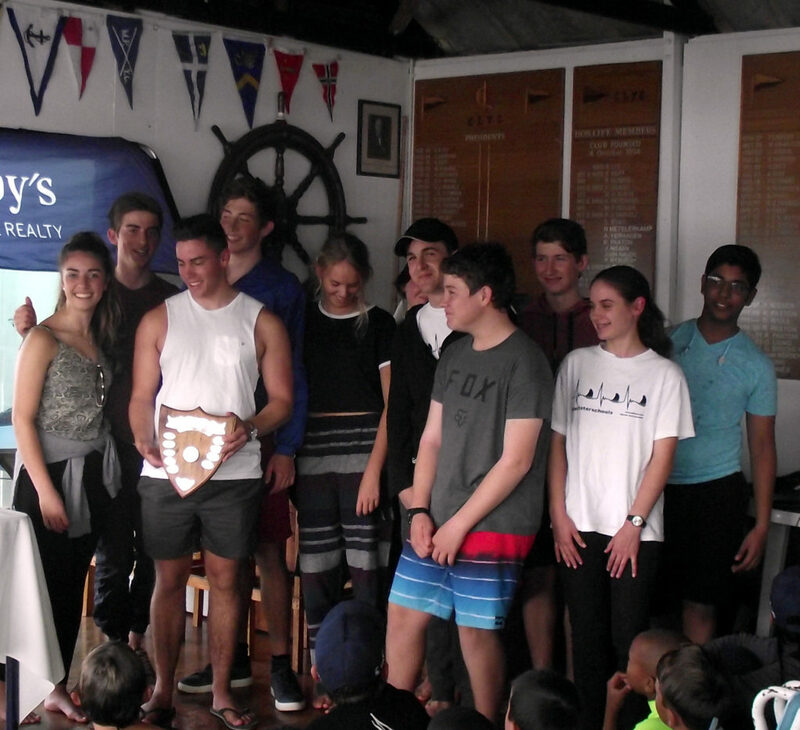 George Lakes Yacht Club hosted the 2018 S.A. 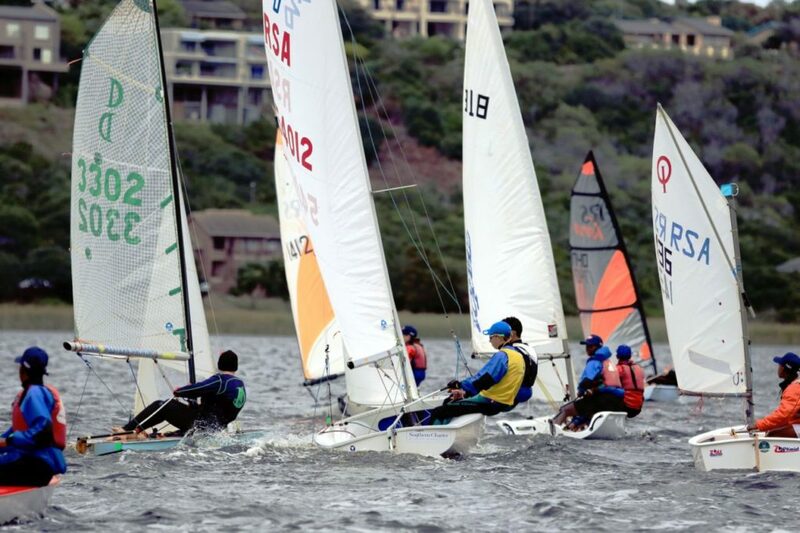 Sailing Eden District Inter Schools Regatta at its Island Lake venue over the past weekend. It was well supported by nine High Schools and five primary schools, coming from Mossel Bay, Knysna and George. 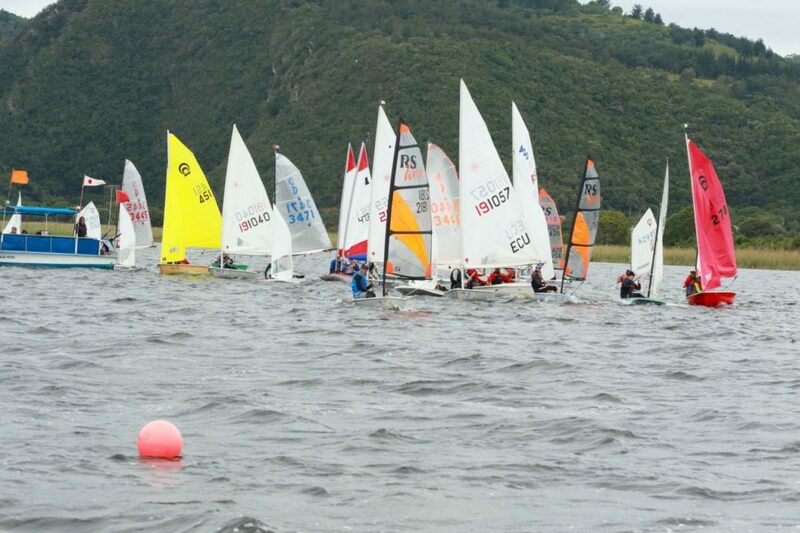 The High Schools fleet had 31 boats and the Primary Schools fleet had 16. On Saturday, there was just a very light, patchy breeze to get the fleets going for the first race. This then faded to nothing and no further races could be held that day. In that race, Ashley Layland (Milkwood Primary, Mossel Bay) on a Tera Pro got line honours on her Tera Pro and was also the race winner, ahead of the Optimist of Sean Vonk (Glenwood House Preparatory). In the High Schools fleet, first place was contested by team mates from York High, Georgou Divaris and James Hellstrom, sailing Lasers. At the finish, Hellstrom was seconds ahead. Yachts of the High School fleet proceeding up the beat. On the left is Luke de Villiers (York High) on Dabchick, center is the 420 of Bradon Kretzman and James Bull (Point High). On Sunday, sailing conditions were much improved, with a consistent breeze of 8 to 10 knots from the south west, allowing six races to be completed. In these races, in the Primary Schools fleet, line honours were contested by team mates from Milkwood, Ashley Layland and Oliver Holden on Tera Sport. However, the Optimists of Sean Vonk and Conrad Holm (Outeniqua Primary) were close behind, to contend for the race wins. Holden got a race win and Holm got two, but then Vonk got three to secure the overall win in this fleet, ahead of Holm and Holden. The start of a race on Sunday for the Primary Schools fleet, with Oliver Holden (Milkwood Primary) on Tera Sport and the Optimists of Sean Vonk (Glenwood House Preparatory) center, and Conrad Holm (Outeniqua Primary) on the right. In the High Schools fleet, it was Georgou Divaris who dominated, getting five of the six race wins of the day, only conceding one to James Hellstrom. 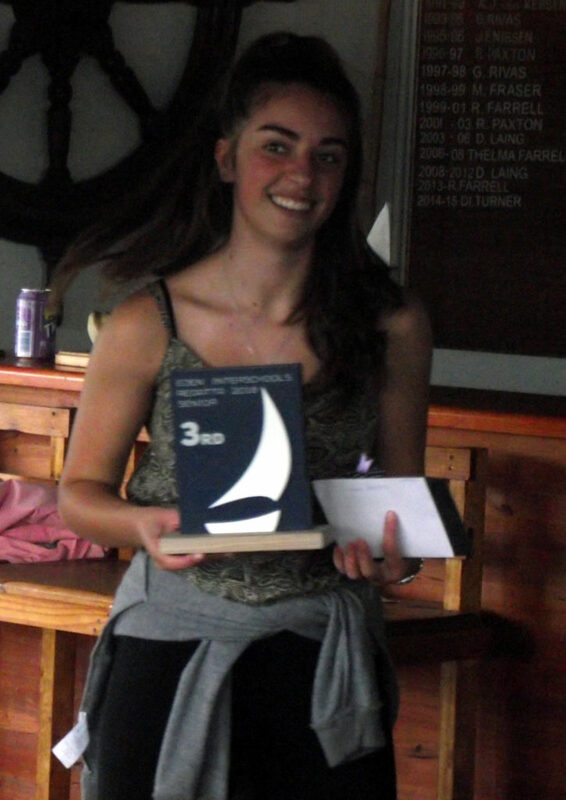 Third place was contested by the Laser Radials of Lameck Jason (Knysna High) and Robyn Hellstrom (York High). Hellstrom was the most consistent to secure the final podium position, also being the first girl in this fleet. With York High taking the first three positions, and six in the top ten, the High Schools winner was clear, with York High retaining the Trophy for the third year in succession. 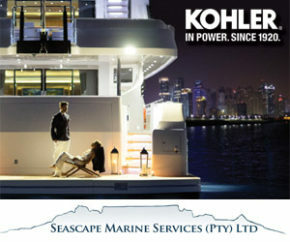 Second place went to Knysna High, ahead of Sao Bras (Mossel Bay). For the Primary Schools, the scoring system calculated a tie on points for first place between Milkwood Primary and Glenwood House Preparatory, thus both these schools were awarded the Trophy as joint winners, with Pacaltsdorp Primary in third place. 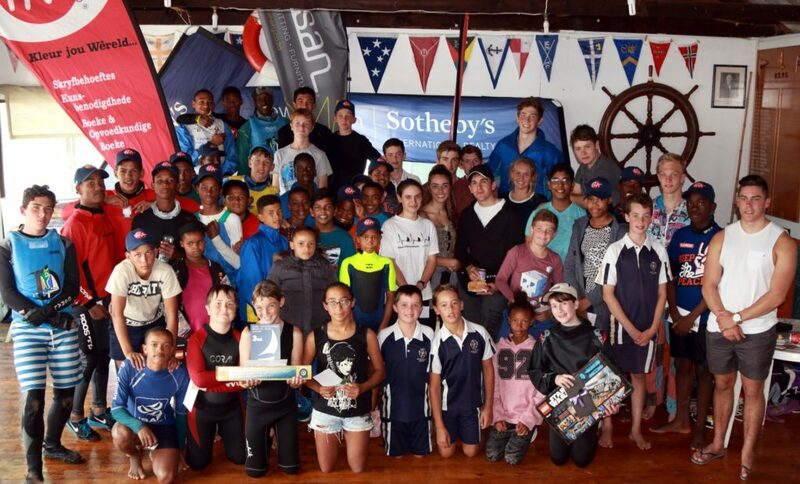 George Lakes Yacht Club extends its grateful thanks to its primary sponsors – Sothebys International Realty (George) and Raubenheimers Attorneys, as well as sponsors George Wildlife Park, PNA, Sportsmans Warehouse, Elevate Trampoline Park, artisan joinery, Sanguine Spa-College, 3@1 Business Centre and the Lego Foundation. 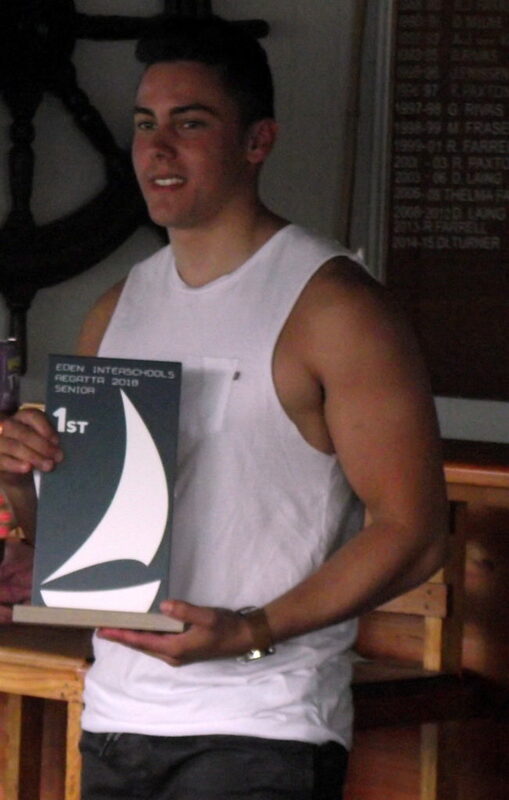 Georgou Divaris was the overall winner in the High Schools fleet. The team of York High, which retained the S.A. 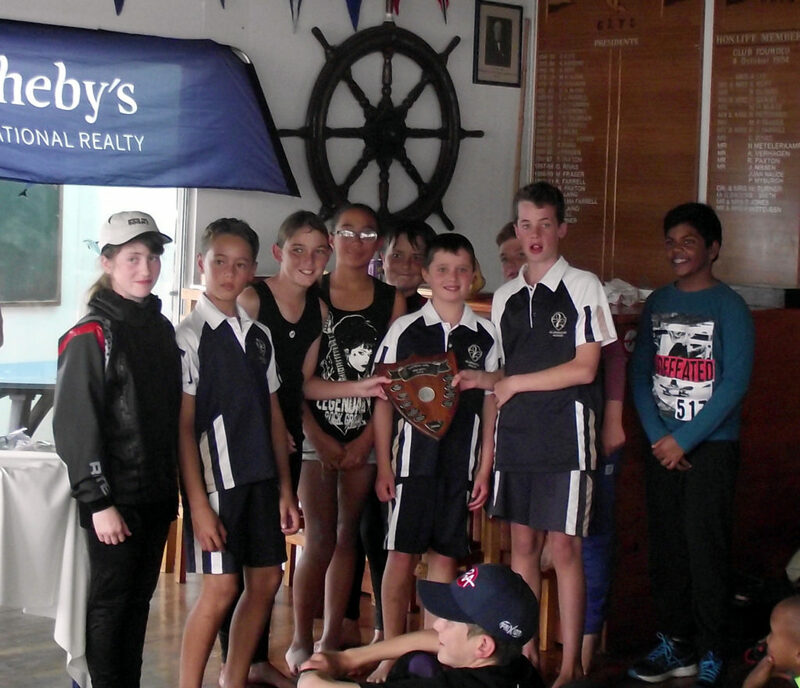 Sailing Eden District Inter Schools High Schools trophy. The teams of Milkwood Primary and Glenwood House College Preparatory (George) tied for first place for the S.A. Sailing Eden District Inter Schools Primary Schools trophy. 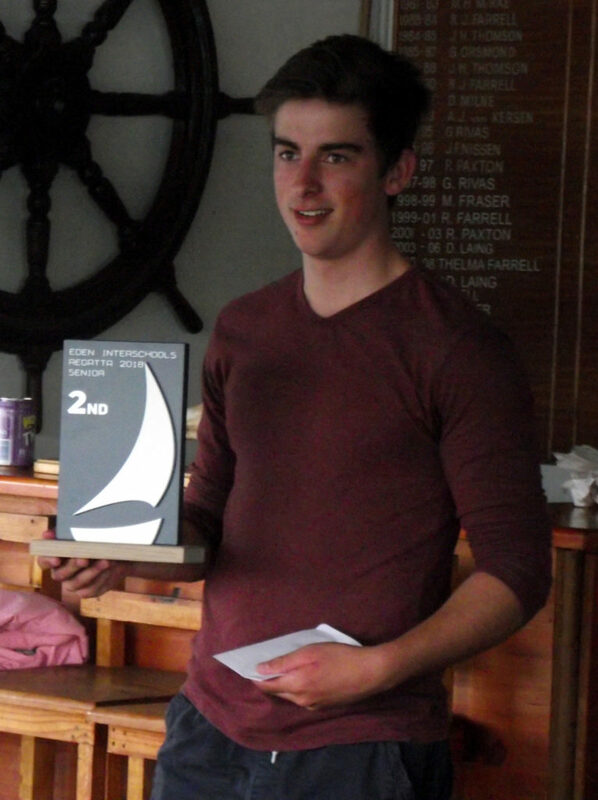 James Hellstrom was second overall in the High Schools fleet. Robyn Hellstrom was third overall and 1st girl in the High Schools fleet. All the participants in the 2018 Eden Inter Schools Regatta at the Prize Giving.